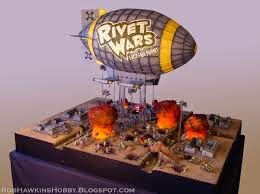 Ogilvie : Rivet Wars, Battle in a Box. 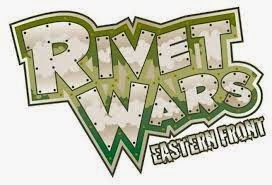 Despite howls of derision from some of the less open-minded individuals of our happy band of wargamers I have dabbled my toe in the board-gaming pond for the first time with a foray into the outstanding new WW1 / Steampunk themed game known as 'Rivet Wars'. The above two images are official Rivet Wars images so hopefully I havent breached a zillion copyright laws and am about the be swooped upon in the middle of the night by sinister leather-coated copywright infringement agents...? ?...now theres a great idea for an IHMN company. This latest foray came about quite by accident in fact. Somewhat naively I popped into my local game supplies store with the intention of purchasing some pots of paint and the latest Wargames Illustrated, mysteriously I emerged many dollars lighter, minus paint and magazine but with the Board Game Rivet Wars grasped firmly in tow. I was pleasantly surprised when I opened the box of goodies. The plastic models are extremely well rendered and once you get past the somewhat comic look of the characters you really appreciate the thought that has gone into their design. The terrain tiles allow numerous layouts and scenarios and the rules are easy to understand. Dont, however, think for a minute that the rules are simplistic. This isnt snakes and ladders. I strongly recommend watching several of the demonstration game videos available for viewing on YouTube to better understand the mechanics and subtleties of the game. A game winning strategy requires careful deployment of your troops and tactical use of the Action and Secret Mission cards. The object of the game is to capture strongpoints or perform secret missions as described on the Secret Mission cards. The winner is the first to reach the required number of VP's as per the requirements of the scenario. In this game Richard adopted a dominant position in the centre backed up by infantry in strongpoints which prevented Dave from achieving enough VP's, even though he raced away to a good start and was leading for over half the game. A word of warning...the game is extremely brutal so dont get too attached to a favourite bit of kit. Your hulking steam tank can be reduced to a smoking ruin in very short order if you're not careful and your infantry will be mown down in swathes if you bunch up and get stonked by artillery...watch out also for those damned wheelie bike things. Faint hearted types or people of a nervous or sensitive disposition should avoid this game at all costs...you have been warned! !